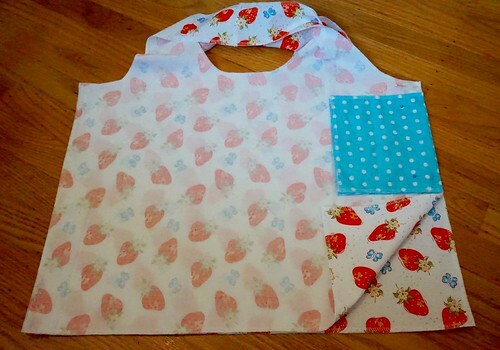 Today I’m sharing a tutorial for my library friends using BurdaStyle’s Charlie Reusable Grocery Bag pattern. 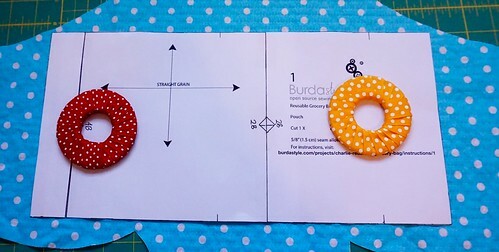 The instructions Burda provides are very basic, and I think to a beginner, they can be confusing, but this pattern is a great one to introduce using a serger, transferring pattern markings, sewing straight lines on a sewing machine, and constructing a flat felled seam (it’s very easy, don’t let that scare you!). Let’s get started. 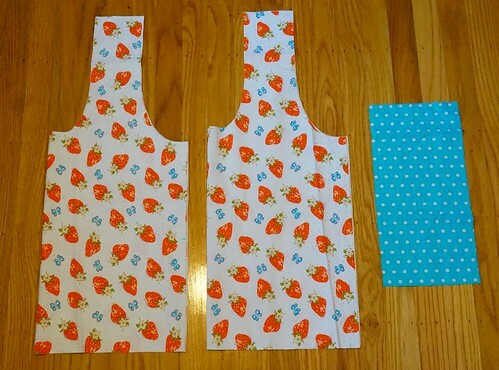 You’ll need ¾ yard of fabric, sewing notions, and your pattern. 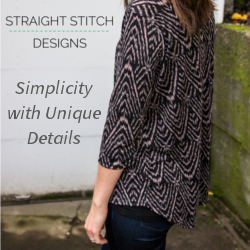 Begin by taking a look at your pattern pieces, taking note where the markings are. 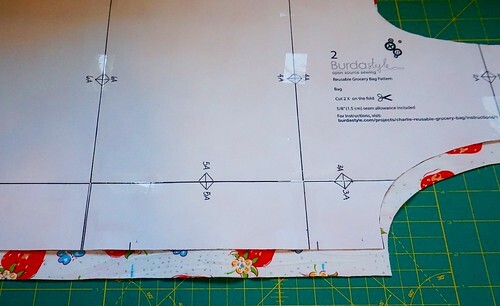 The bag pattern piece is cut on the fold of your fabric. 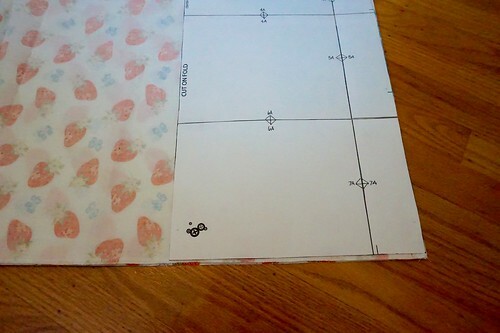 Be sure to fold your fabric so the pattern fits on the fold, and cut around the pattern. You will repeat this twice for two bag pieces. 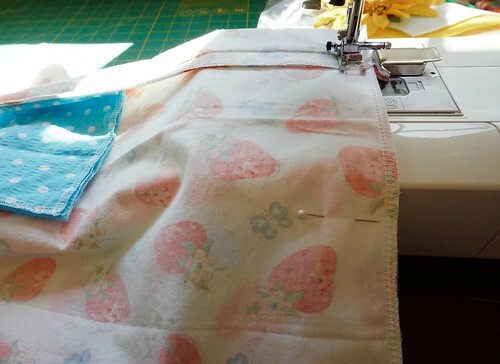 On one of your bag pieces, mark the placement for the little pouch using a fabric marker, as well as the line markings at the bottom corners. 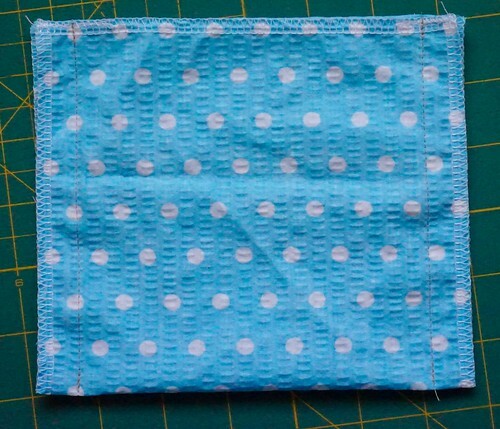 Now take your pouch pattern piece, place it on your fabric noting the grain lines, and cut one pouch piece. 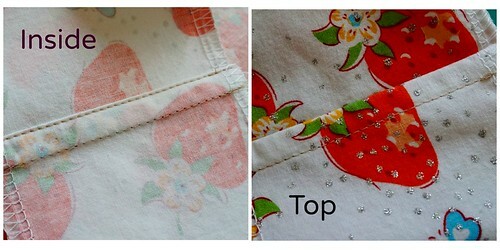 Also transfer the pattern markings to the fabric. You should have two bag pieces and one pouch piece of fabric. Now comes the fun part! 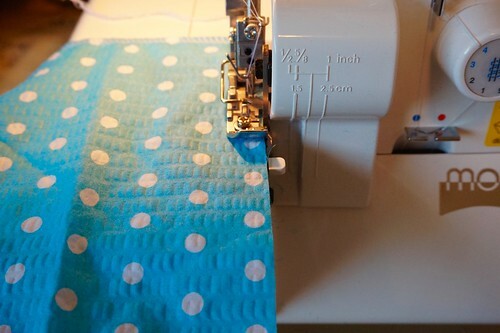 We’ll get to know our serger (if you’re not using a serger, you can sew zigzag stitches around the edges). We are going to serge all of our edges to keep them clean and finished. Around the curves of the bag, serge using a 5/8” seam allowance (look at the pic above, you can see the 5/8″ seam mark just above my fabric edge), ultimately removing 1/2” of fabric with the serger’s blade. This can be a bit tricky since it’s a curve, so go slowly. 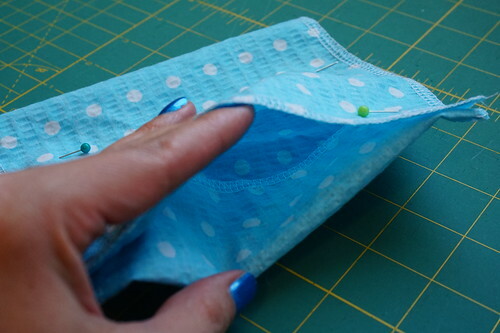 Also, don’t forget to weave in the ends of your serged seams (I only did this at the small top lip of the pouch, and the top corners of the bag pieces). Thread a needle with your serged tail. Pull it through the serged seam about an inch and cut the rest of the tail. 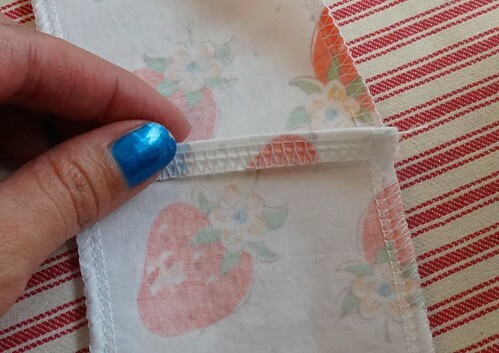 Take your pouch piece, right side up (the side that is the front), and fold the small flap down at the markings first, then fold the longer side up over the small flap so the top edge meets the folded edge. 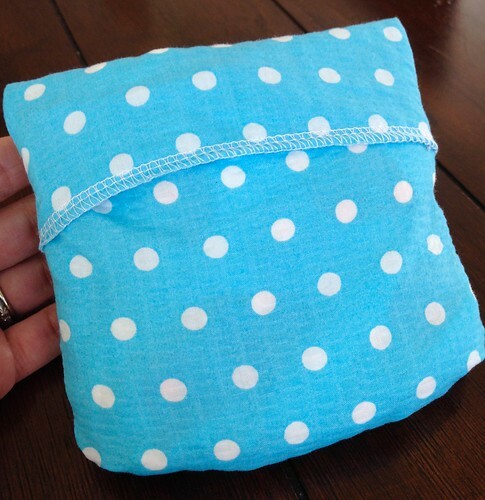 Sew the sides of the pouch using a 5/8” seam allowance. Your throat plate may have the seam markings on it, so use those to help guide you (a nice trick is using a post-it note too). You can see the sewn seams at the sides. Set your pouch aside. Now take one of your bag pieces. 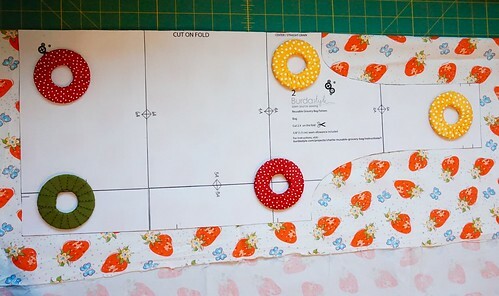 Place the handle pieces right sides together and sew using a 5/8” seam allowance. 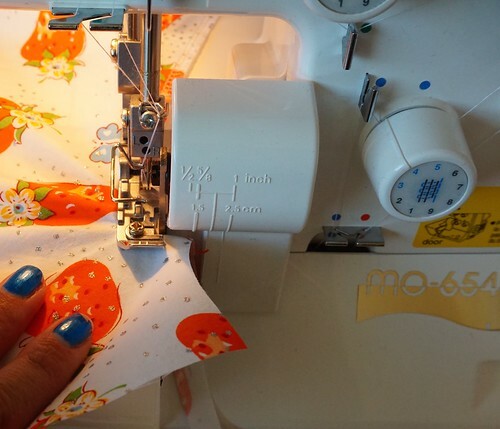 Press seam open, then trim half of one of your seam allowances. 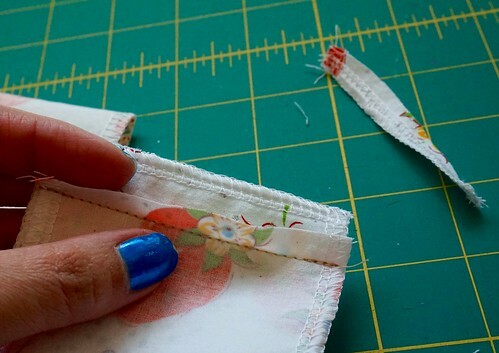 Fold the longer seam allowance edge down over the shorter seam allowance you just trimmed, lining it up to your stitch line, and press. 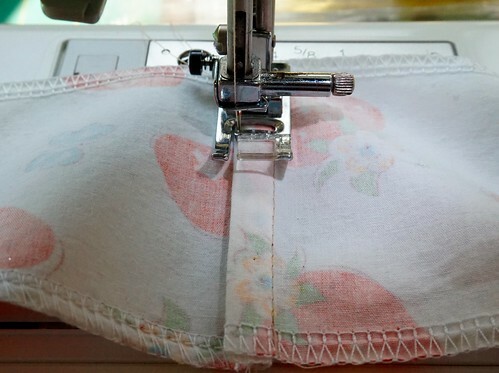 Now fold the whole thing over at the stitch line and press again. 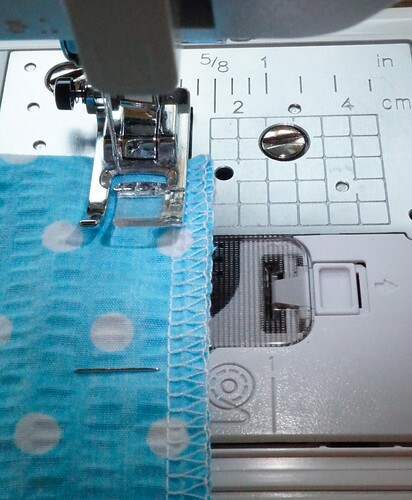 Finally, topstitch (it can be a little easier to start about ½” in from the edge, then backstitch, to begin your topstitching, as your sewing machine may not like the thickness of the seam) and voila! You’ve just sewn a flat felled seam! Go you! Now repeat it with the other bag piece. Almost done!!! Take the bag pieces and place them right sides together. 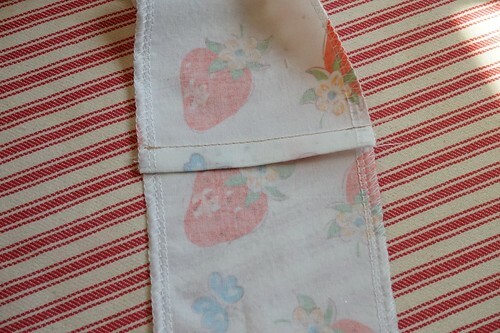 Take your pouch (still wrong side out) and line the closed end up with the bag markings, pinning to secure. Make sure your pouch opening is towards the middle of your pouch, not the edge. Baste the pouch in place to secure if that makes you more comfortable, otherwise just pin in place. 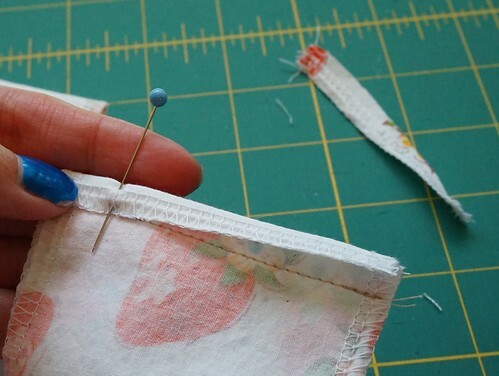 Sew down the sides of the bag’s edges with a 5/8” seam allowance. Press your seams open. 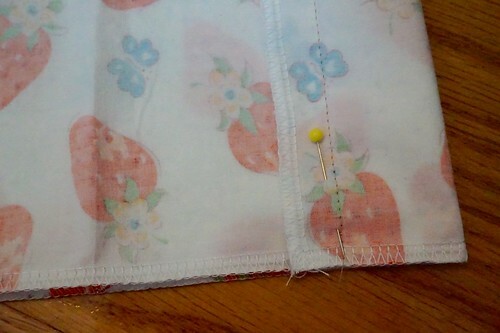 Where you transferred the markings from the bottom corner of your pattern, fold in and pin (the fold at the right is where the purple mark was). This is the step most people find confusing. 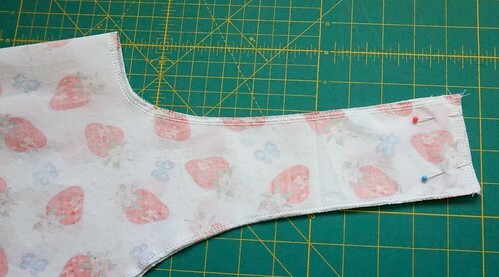 Now sew the bottom edge closed using a 5/8” seam allowance. Turn right side out and you’re done! Look at that corner! 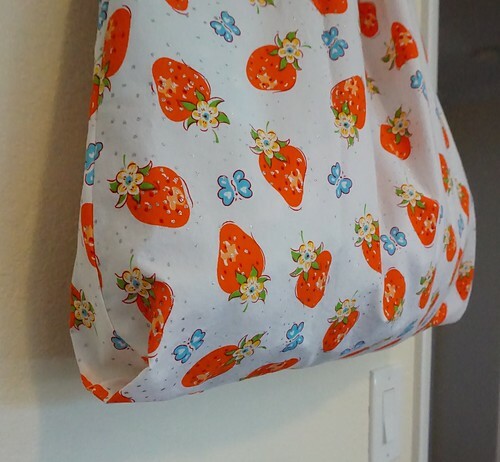 You can also fold the bag into the handy pouch, and since it’s attached, you won’t lose it. These are so great to have on hand when going to the store, and they also make quick little gifts. 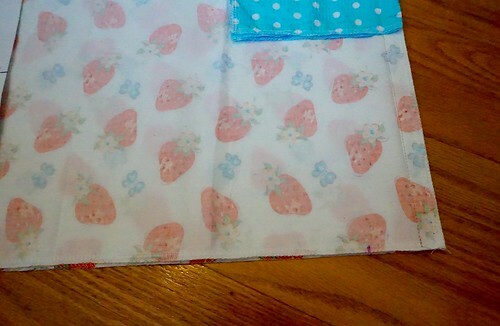 I’m just happy I was able to use up this rough strawberry fabric and make something very cute and useful!